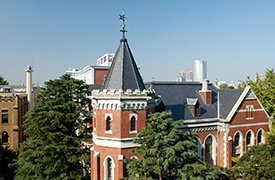 The personal web site of Hideo Akabayashi, Keio University, Japan. This is the personal web site of Hideo Akabayashi, Keio University, Japan. My research interests are education, family, labor, and broadly applied microeconomics. My research aims to discover new economic insights and supporting evidence using appropriate methodology and data. In order to help developing a better research environment of the above fields in Japan, I am devoting my time to expand the data availability and to create an interdisciplinary research community.